About 6 years after Hubble discovered that the existence of other galaxies, he also published a paper that led to the realization that the universe was expanding. And only recently have we discovered that not only is it expanding, but the expansion is actually accelerating! In effect this actually implies that every galaxy is moving away from every other galaxy. Well, almost every other galaxy. Perhaps one of our most well known neighbors, M31, or the Andromeda Galaxy, is actually moving towards us. This was determined by measuring the amount of ‘blueshifting’ occurring due to the Doppler Effect. It is currently 2.5 million light-years away from us, but has its course set for a head on collision with our own Milky way galaxy. And it is making decent headway with a speed of 400,000 km/hr (which is fast enough to travel from here to the moon in one hour). Despite this, it will still take approximately another 3.75 to 4 billion light years for it to reach us. During the initial collision it may be tempting to imagine that many of the stars will plow into each other, totally decimating many of the solar systems within both galaxies. But this may not be the case. Due to the extreme distances between stars within each galaxy, the chances of collisions occurring are extremely small. However the galactic center will shift, altering the orbits stars currently hold. Moreover, the space within galaxies contains many clouds of dust and gas and when the clouds meet, the force of the impact compresses this matter compactly together, and stars may form if the gravity becomes overwhelming, collapsing the clouds into an inferno of star-birth. After the initial collision, data derived from Hubble’s calculations indicates it may take up to a further 2 billion years for the 2 galaxies to reshape into a single larger elliptical galaxy. This fantastic illustration provides a guesstimate on what the different stages of the collision will look like to an observer on Earth. 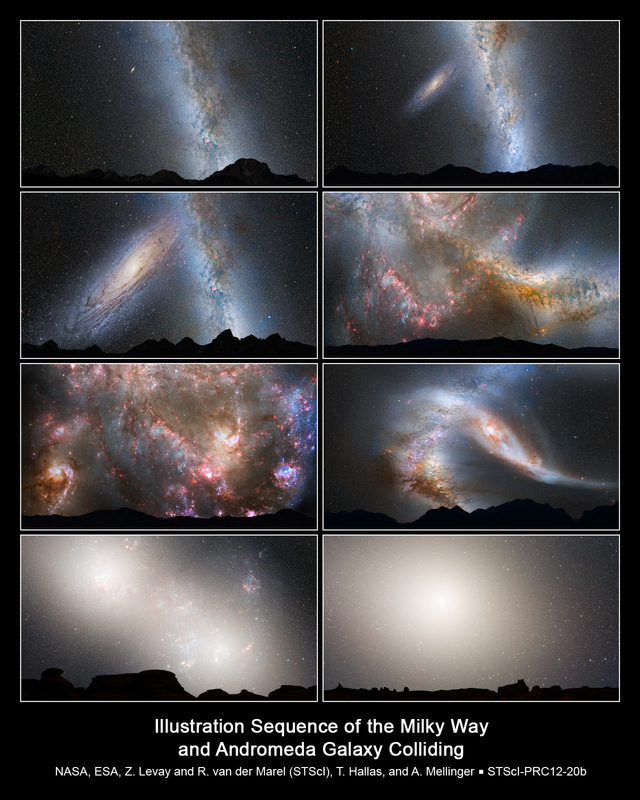 This series of photo illustrations shows the predicted merger between our Milky Way galaxy and the neighboring Andromeda galaxy. First Row, Left: Present day. First Row, Right: In 2 billion years the disk of the approaching Andromeda galaxy is noticeably larger. Second Row, Left: In 3.75 billion years Andromeda fills the field of view. Second Row, Right: In 3.85 billion years the sky is ablaze with new star formation. Third Row, Left: In 3.9 billion years, star formation continues. Third Row, Right: In 4 billion years Andromeda is tidally stretched and the Milky Way becomes warped. Fourth Row, Left: In 5.1 billion years the cores of the Milky Way and Andromeda appear as a pair of bright lobes. Fourth Row, Right: In 7 billion years the merged galaxies form a huge elliptical galaxy, its bright core dominating the night-time sky. Can we induce artificial gravity in space?